Bharat Sanchar Nigam Ltd (BSNL) has launched a New 2G Postpaid plan with Unlimited Free Incoming Roaming facility at a rent of Rs. 299 specially for Central Paramilitary Groups like CRPF, ITBP, BSF, BRO etc & named it as “Rakshak”. In this plan the activation charge will be free and subscribers can enjoy on net local and STD calls for 75 mins along with 100 Local and National SMS per month on both SIM Card. Further the call charges are flat for all calls whether local std or raoming calls. Calls between primary & secondary number upto 30mis/day would be charged at 20p only, after which regular apply. Also all sms will be charged at 49p flat. 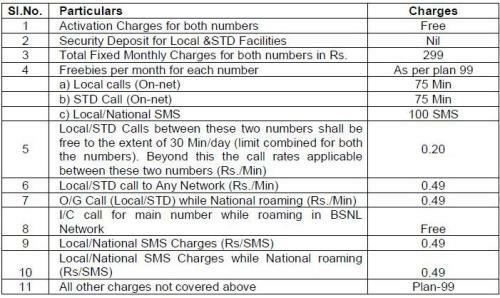 Both main SIM & Home SIM will be issued/activated from the BSNL CSC of the respective circle and bill payments can be made in the Home circle. There would be a Fixed Monthly Charge of Rs. 299 which is the total fixed monthly charges for two postpaid connections. All tariffs applicable for main number, except Incoming call while roaming, will be the same for home number.